WATER SUPPLY WILL be restricted in the greater Dublin area at night for the foreseeable future, it was announced today. Speaking today at the latest meeting of the National Emergency Coordination Group in the aftermath of Storm Emma, Gerry Grant – managing director of Irish Water – said that the measure was necessary. He said that pressure will be restricted to customers in the greater Dublin area between 7pm and 7am. The move is kicking in tonight. “Despite the huge effort that has been made… we will have significant numbers of people with water restrictions over the coming days and probably weeks,” he said. Earlier, Irish Water said that over 10,500 customers had no supply in the wake of the storm, and 121,000 people had restricted supply. Grant said that in particular Dublin has been impacted by a large number of leaks and issues which has greatly affected the supply. “We are clear in our mind now that we will have to have a multifaceted approach to the greater Dublin area over the coming days and weeks,” he said. “That will involve appealing to people to conserve water, it will involve pressure management during the day where we can, it will involve a lot of additional crews on the ground finding and repairing leaks. But it will also require us to put on restrictions and we believe that it will be necessary for us to restrict pressure from 7pm to 7am for the foreseeable future. He said that initially the restrictions will be spread across the entire supply. “I think at this point we will be trying to make it as broad as we can to get the maximum benefit,” he said. Essentially the purpose of these pressure reductions at night-time is to starve the leaks. And the wider we can apply that better in order to conserve water in the reservoirs. Grant said that if this approach didn’t work, Irish Water would perhaps look into bringing in further restrictions in other areas. “This is not something that we will resolve in the next day or two,” said Grant. What we may see in the next day or two is I think a better picture of what the balance of different pressures are. In a statement this afternoon, Irish Water said that it is working as part of the National Emergency Committee and in partnership with local authorities to minimise the risk to customers and to restore full supply. It said that that the greater Dublin area saw an increase of over 10% in demand from Friday to Sunday. As a result, Irish Water will reduce water pressure in Dublin, parts of Wicklow, Kildare and Meath from 7pm tonight to 7am Tuesday 6 March when supply will begin to return to normal levels. This is essential to allow our reservoirs to refill as repairs to bursts and leaks are underway. Hospitals on the network will be prioritised and have water diverted to them. Irish Water said it needs to reduce water pressure in order to minimise the impact on homes and businesses and in a bid to avoid widespread outages. Homes will have storage in their attic tanks and businesses should also have storage on site. On high ground and on the extremities of the network, people may experience some outages. It said it is reviewing the situation on an hourly basis, and that vulnerable customers are being contacted to provide advice and support. What will water restrictions mean? We asked Irish Water, who said that most people should have water in their attic (or otherwise) water storage which will enable them to have showers or use the sink. 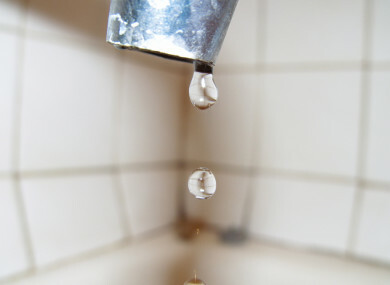 The water pressure might be slightly reduced – something which you will particularly notice if you live in an area that is elevated. Don’t use the washing machine or dishwasher during the restriction period, or run a bath – Irish Water is asking people to conserve water, which none of these activities do. The spokesperson said that people should generally not experience major outages of water, though this may depend on their individual circumstances. Over the weekend Irish Water repaired three bursts in the North Docklands, Infirmary Road and Skerries. Irish Water is now appealing to homeowners and businesses to conserve water at this time – advice on how to do so is available on water.ie. Any visible leaks should be reported to Irish Water on 1850 278 278. Email “Water supply to be restricted across greater Dublin area from 7pm tonight - 7am tomorrow”. Feedback on “Water supply to be restricted across greater Dublin area from 7pm tonight - 7am tomorrow”.